/ Archaeologists use a portable X-ray fluorescence detector to analyze 900-year-old artifacts. Sometime in the late 12th century CE, a merchant ship laden with trade goods sank off the coast of Java. The 100,000 ceramic vessels, 200 tons of iron, and smaller amounts of ivory, resin, and tin ingots offer a narrow window onto a much broader world of global trade and political change. The merchant vessel that sank in the Java Sea was the pointy tip of a very long spear, and a new study sheds some light on the trade networks and manufacturing industry hidden behind its cargo—all thanks to a little help from a cool X-ray gun. There was a network of trade routes that crisscrossed the Indian Ocean and South China Sea by the late 12th century, linking Song Dynasty China to far-flung ports in Japan and Southeast Asia to the east, Indonesia to the south, and the Middle East and eastern Africa to the west. Merchant ships carried crops, raw materials like metals and resin, and manufactured goods like ceramics along these routes. Today, ceramics are a common sight in shipwrecks in these waters, partly because the material outlasts most other things on the seafloor, and partly because of the sheer volumes that could be packed into the holds of merchant ships from around 800 CE to 1300 CE. Archaeologists have found Chinese ceramics at sites stretching from Japan to the east coast of Africa. And excavations in Southeast China have unearthed several kiln complexes, each with hundreds of dragon kilns—long tunnels dug into hillsides, which could fire up to 30,000 ceramic pieces at a time—clustered into a few square kilometers. All that production was aimed at exporting ceramic bowls, boxes, and other containers to overseas markets. 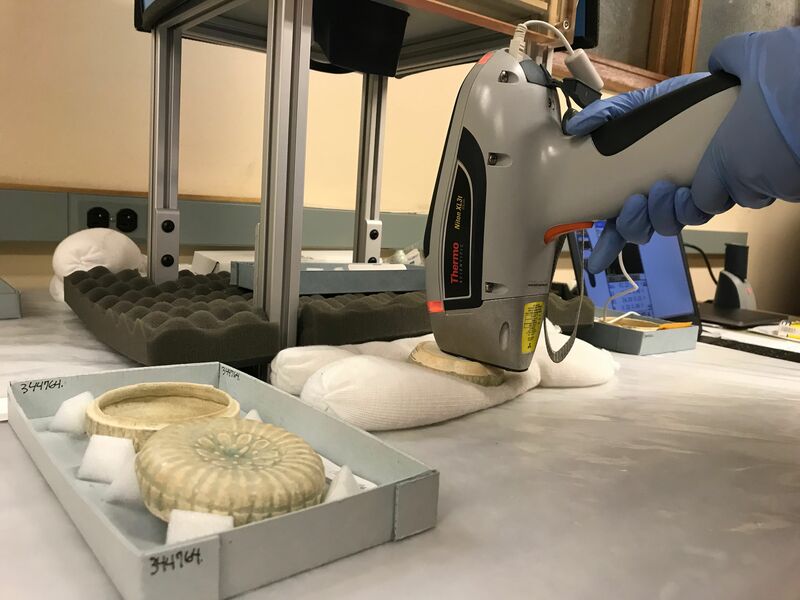 “Most ceramics from this region are seldom recovered from domestic settings in China and are almost exclusively found along the maritime trading routes,” Field Museum archaeologist Lisa Niziolek, a co-author on the study, told Ars Technica. The top-of-the-line stuff, called qingbai, came from a complex called Jingdezhen in Jiangxi province: fine vessels with translucent light blue glaze over a smooth white outer paste. But kiln complexes all over China supplied a booming market in knock-off qingbai. The kilns of Fujian province, in particular, turned out imitation qingbai vessels in the thousands—lower quality, but much higher volume. Last year, a label on a ceramic box from the Java Sea Wreck traced that box to the capital of Fujian Province. Fujian once boasted many kiln complexes spread over a wide area, and many of their wares looked pretty similar (that was the point, after all). To figure out which kiln complexes supplied the Java Sea Wreck’s cargo, University of Illinois archaeologist Wenpeng Xu and his colleagues needed to look at the chemical fingerprints of the thin bluish glazes of the ancient ceramics. That’s where the X-ray gun—technically called a portable X-ray fluorescence detector—comes in. Xu and his colleagues search for dragon kilns near the Dehua complex. Pathways leading to dragon kiln sites. An archaeologist searches a debris pile for qingbai fragments. A Song Dynasty ceramic storage jar plays host to marine life. A fragment of a qingbai bowl from the Java Sea Wreck. Archaeologists use a portable X-ray fluorescence detector to analyze 900-year-old artifacts. When X-rays hit something—like a 900-year-old ceramic bowl, for instance—the atoms in the bowl tend to fluoresce, or emit energy in the form of photons. Each chemical element tends to emit photons in its own unique frequency, so by counting the photons of different frequencies, an XRF detector can “read” the chemical makeup of an object. In this case, Xu and his colleagues were interested in the glaze—the thin outer layer—of ceramics from the Java Sea shipwreck and four kiln complexes in southeastern China: Jingdezhen, Dehua, Huajiashan, and Minqing. Xu and his colleagues scanned 60 ceramic fragments from the wreck, and their chemical signatures clearly fell into four separate groups, each of which matched one of the four kiln complexes. It turns out that the ship destined to become the Java Sea Wreck had stocked its hold with not only a selection of real qingbai ceramics, bound for foreign ports, but also a wide array of knockoff wares of varying types and quantities, which Niziolek says came as a surprise to the archaeologists. “Finely made qingbai wares from Jingdezhen only account for a very small percentage of the cargo,” she told Ars Technica. “The majority of the qingbai wares came from kilns in Fujian province, which produced a huge number of ceramics for export to markets in East and Southeast Asia and other parts of the Indian Ocean World.” And that reveals much more complexity in the trade networks of the medieval Pacific than most archaeologists and historians usually suspect, connecting potters far inland in southeastern China to markets around the Indian Ocean. Xu and his colleagues say that, based on their findings, the ship probably stopped at the port of Fuzhou to take on ceramics from Jingdezhen, Minqing, and Huajiashan, which could have traveled by riverboat to the port. It would have then headed 180km (111 miles) south along the Chinese coast to the port of Quanzhou to take on more wares from the kiln complex at Dehua. “Results of this study show that a large number of ceramics in the cargo were produced at kilns in northern Fujian, which are closer to the port of Fuzhou,” Niziolek told Ars. If they’re right, it means the medieval merchant captain was making a conscious decision to add time and distance to the journey in order to carry a wider selection of wares to markets in Indonesia. From China, archaeologists think the ship was bound for the bustling Javanese port of Tuban when it met its fate. It wasn’t the first or the last ship lost in those waters. “Chinese ceramics dated to this time period have been found in the area, and there are reports that many of these came from shipwrecks off the coast there,” Niziolek told Ars. The crew undoubtedly knew the risks of an ocean voyage, but it’s unlikely they could have imagined that centuries later half of their cargo would be stored in a museum in a city that didn’t yet exist. That underscores how much archaeologists still stand to learn from a shipwreck first excavated in the 1990s—its artifacts have been at the Field Museum since 1999. In 2011, Xu, Niziolek, and their colleagues started a large-scale project to track down the sources of the objects found at the wreck site.